Japan is a “Galapagos Market”, so called because its unique regulations lead to unique species of vehicles seen almost nowhere else. Including just about the entire Daihatsu lineup. 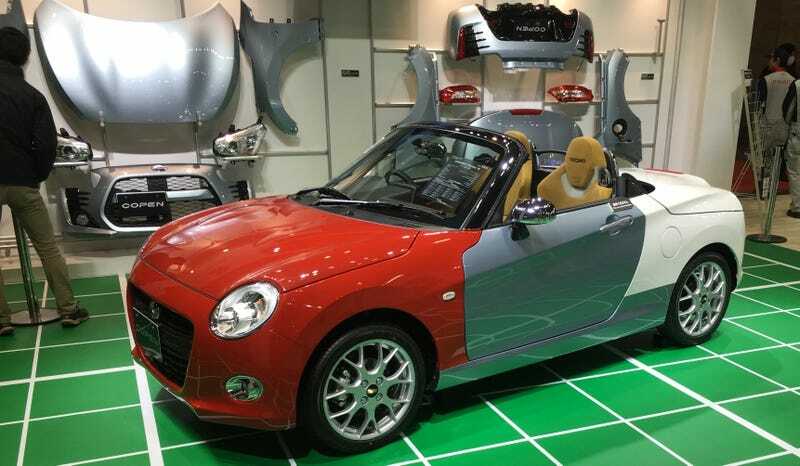 That includes the modular Daihatsu Copen. You can have any Copen you like as long as it’s... er... 64 horsepower. The rest is up to you! As should be pretty clear by the initial images, the modular version of the Copen has been specifically design to allow easy changing out of panels from the chassis and underbody. Of course, it would be easy enough just to make that mean that you could choose a few different colors, or even several like the case of a VW Harlequin but Daihatsu went way beyond that. The panels, as well as grills, headlights, taillights, and such are themselves designed differently, thus allowing for several different variations of possible Copens. The size of the vehicle, as well as its internals won’t change, of course, but instead of one car, you could decide to have a few. Sort of. In addition to the display model at the recent Tokyo Auto Salon you could actually work with Daihatsu technicians to build and change, there were a number of put together concept models. My favorite was the hot hatch looking Copen Robe Shooting Brake Concept in a beautiful sheen of navy blue. I’d want more amber, like the side markers, or the headlights, and different wheels, but I love the over all shape. Other versions included a sporty red coupe and some kind of sport utility beach comber thing? I think? Not my style, but maybe someone’s.